For those looking for more ear-aching nostalgia after “enjoying” the first “monophony EP”, I present further 21 minutes of PC speaker music. For the excellent Roland MT-32 version visit the Soundtrack Island. 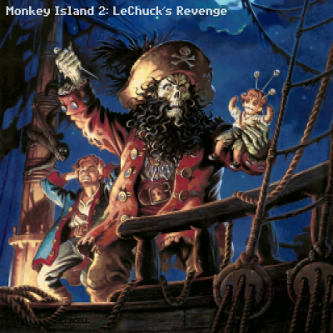 The Amiga and Macintosh versions of “Monkey Island 2: LeChuck's Revenge” can be found at LucasArts Soundtracks. *) also involved in the making of the soundtrack: Robin Goldstein & Anthony White.